Why do you go to a spinning festival anyway? 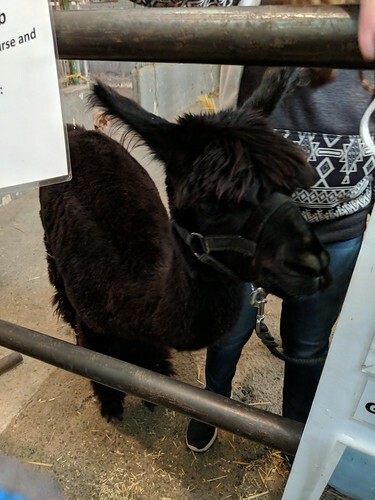 Llama love – that’s T’s hand! 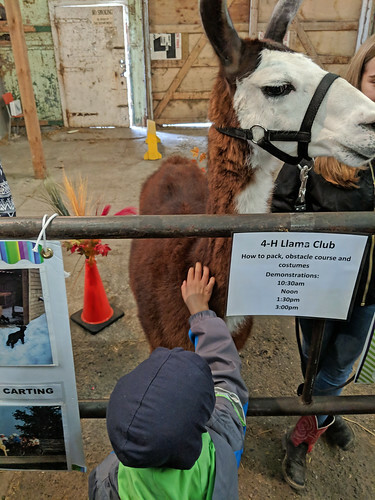 The 4-H Llama Club brought super tolerant llamas. This sweetheart was almost eye-level with 6 year-old T! There was enough time & space in this Festival Barn space in particular for the little ones to enjoy their experience. The volunteers did a fabulous job! 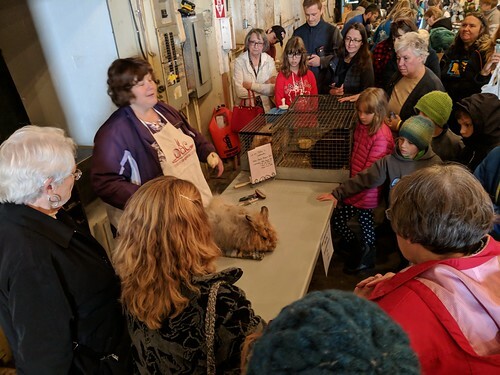 After a bite to eat we found the angora rabbit demonstration starting next door in the Marketplace Barn. I was happy to point out kids in handknit (are they handspun too, I don’t know!) hats, rush a goodbye and head for the vendors’ stalls. T learned a lot, snuck a pet mid-demonstration (you did?!? yes), and is not very sure about plucking fur from angora rabbits being exactly kind to them. I demurred not being an expert. Reason Number 2, buy all the things! This reason covered seeing friends – vendors & attendees alike. My purchases year-over-year are down but still not what you would call paltry. 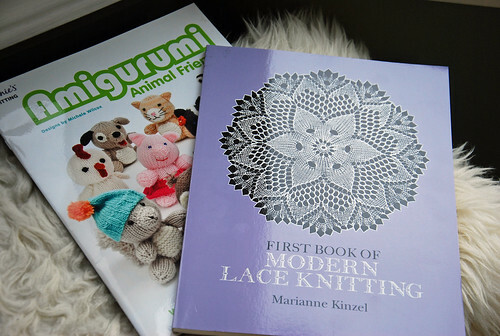 While I was in the Gemini Fibres line with a copy of Marianne Kinzel’s First Book of Modern Lace Knitting, T ran up beaming with his find & pleases. To go with a WIP handspun monster he asks for the Michele Wilcox owl & chicken first from her Amigurumi Animal Friends. Alrighty! Visiting Sasha’s booth for Sheepspot was a special treat. So impressive was it all that T asked if she owned & operated the Auditorium! We had nice chats through the day, and I brought home this Shetland top (104 g, ‘Autumn Wedding’ colourway) with other fibre & yarn. 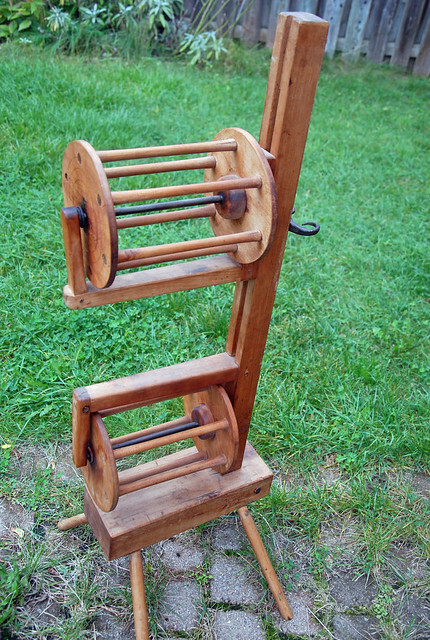 They are the only local sellers of Greensleeves spindles if you are looking for good ones. This braid was handled exactly as I did the Furiosa Shetland top, i.e. divided by length into thirds, and spun end-to-end. My guess is that they will show how different the same spinning can look where the only variable is the dyer’s colourways. Tools, breed, and ply structure will be all the same. It will be interesting to compare them! The wheel is Wee Peggy, and I didn’t change her set-up, scotch tension, 5:1. It is a 1982 (i.e. 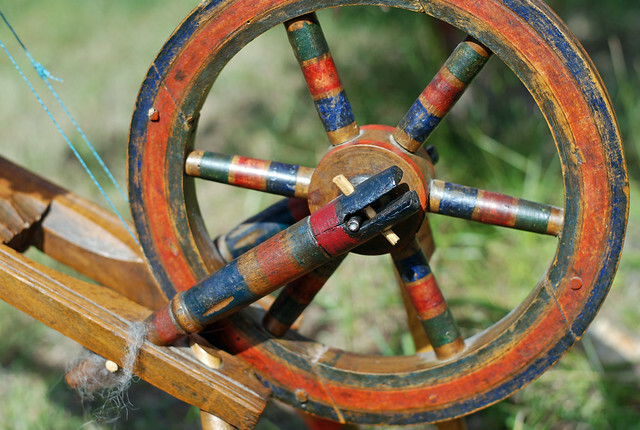 late version) Rappard kit wheel that my friend Margaret bought, and sold to me for a first wheel. 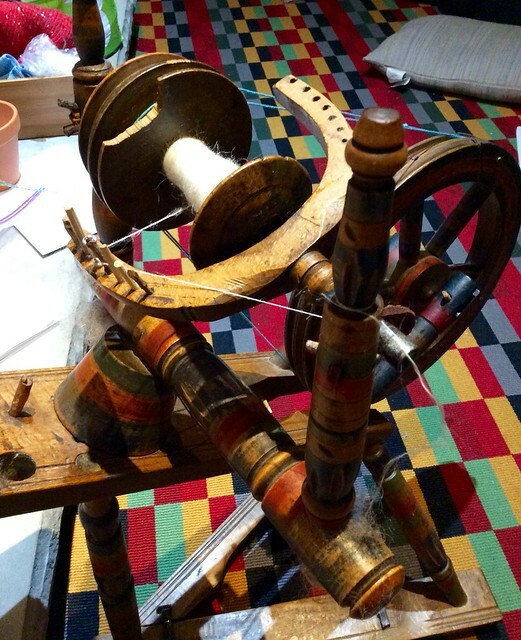 Mary Knox has given a timeline comparison of the Peggy wheel designs here. 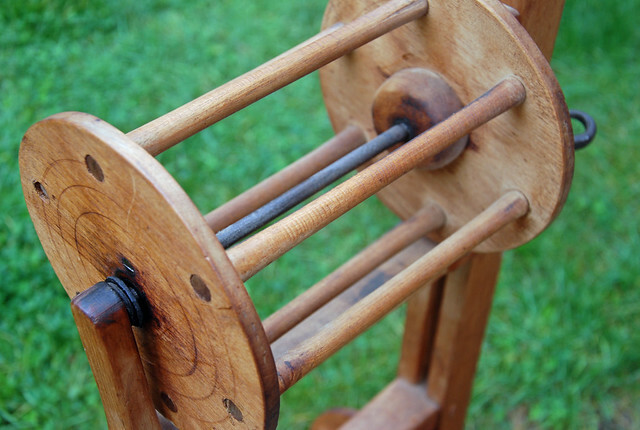 Since this wheel has been home, I have spun with the Willow Tree figure on the back maiden. She holds a conch shell to her ear, and if she’s here for luck it’s been working! As for other purchases most were re-stocking, and I also got dyestuff from John at the Fibre Garden. Hopefully it all spills into TKK as we go through to the next Festival. 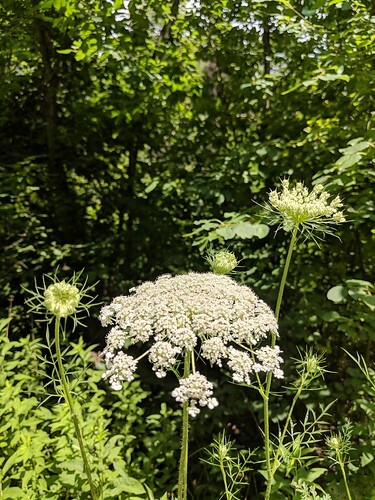 An interesting new-to-me vendor was Karberry Farm from Mountain, On. Their Shetland was tempting but I chose 2 colours of Jacob roving (raised by a neighbouring shepherd). Jacob is listed as critical in the Breed Conservation List 2015 of Heritage Livestock Canada. 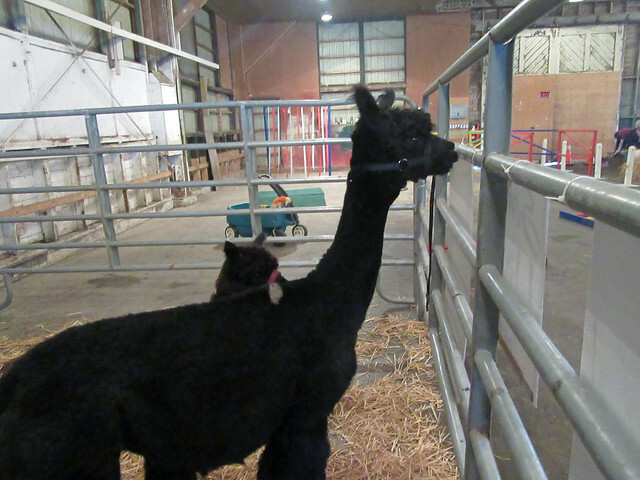 It was a joy to see a 1-30 animal category rare breed at Woodstock! I was in danger of grabbing the bag of raw fleece but am glad that I resisted. 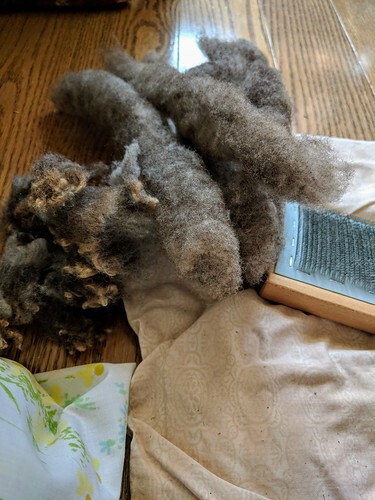 Cleaning fleece as I do in the kitchen is more difficult to arrange, and I don’t like keeping wool raw if I can help it. 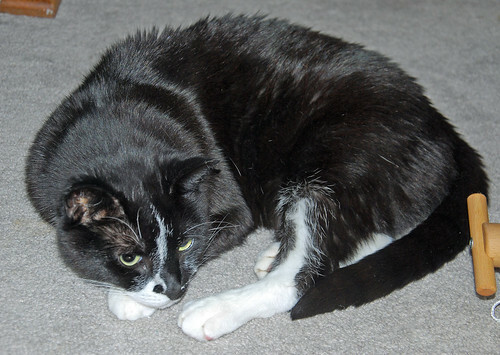 A quick update is that Melvin has been stable through the summer & fall on his new regimen for feline diabetes. Here he is to my right as I typed this morning (the Erica loom is beside him in the picture). Apart from being mighty vocal on the dot of his feeding times, our Melly cat is doing pretty well, and regaining weight that he lost rapidly in the spring. We will be doing a new blood curve shortly to find out more. 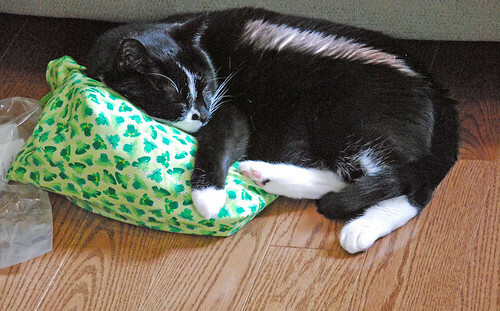 Melvin is still our only pet, and I have been feeling a tug towards adding another to the home. 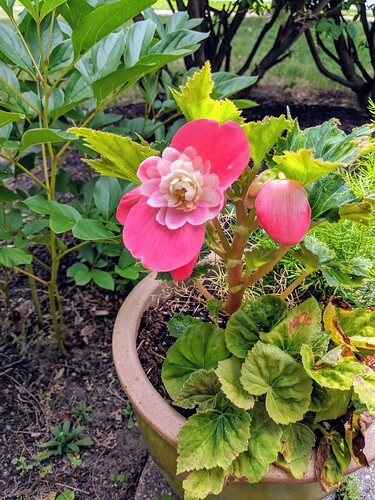 It’s open-ended but we all agree. 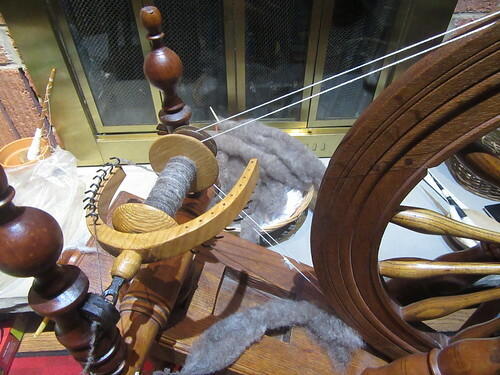 Categories: Fairs & Fiber Festivals, Spinning, Stash in; Stash out | Tags: Equipment, Fauna, Shetland wool, socializing, Spinning, Wee Peggy wheel | Permalink. This is the great use of our March break that I hinted at in past posts – all finished, and one scarf is in happy use. It is based on a pre-wound pair of warp chains of Fantastic Knitting Zephyr (merino/silk, 5,040 YPP) 6 yards long. Warp sees light of day! In the last weeks of T’s first school term, mid-June 2017, I was so stressed that I thought weaving scarves would be just the thing. There I had the most beautiful 2 balls of knitting lace yarn in a colour that a (former) friend thought would be great on me. She was correct but I just had not wanted to knit that much Suede in lace at all. This is how I learned that stress weaving is not yet my thing. I was short by half of the bouts I wanted for comfortable twill scarves. 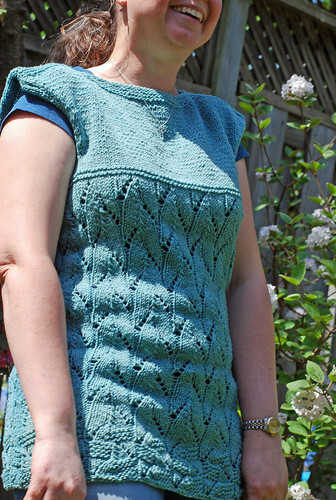 It needed re-working but my mind was not to be trusted with anything but knitting needles at that point. Clearly. There is a literal inked-in note of the yardage requirement for my first idea: 1,728 yards of Zephyr. The rub? I had 1,260 yards, and ignored the shortfall at my peril. But wait. It ends well! No to twill! This weave, found more or less by accident, was the direct cause for my three-shaft passion. Passion is understating Erica de Ruiter’s work in this area but I digress. 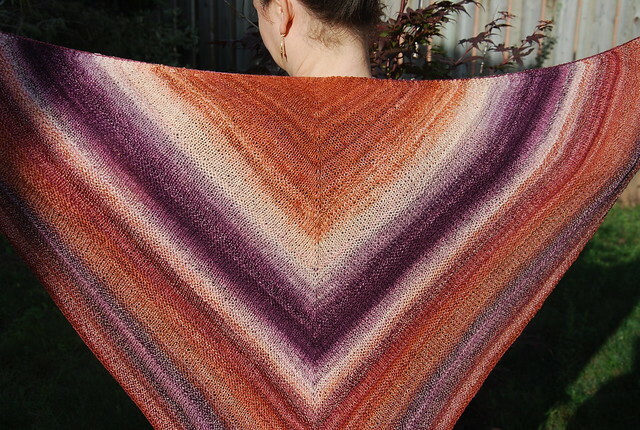 This effect proved wonderful for showing-off my handspun camel/silk that is 3,560 YPP and only 2 ounces from Schafenfreude Fibres. It was spun as long ago as July, 2013. Another breakthrough was weaving with my new Bluster Bay end-feed shuttle (Honex tension) in black cherry. Now that was a splurge worth making! I wound the pirn using my Leclerc electric winder. New Bluster Bay EFS in action! 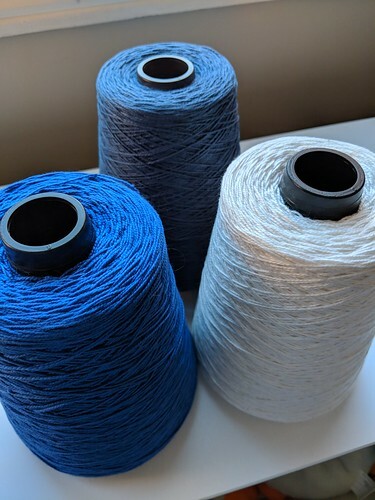 The weft now showing is Aura Lace (35% alpaca; 55% tencel; 10% nylon; 4 oz = 568 yards). 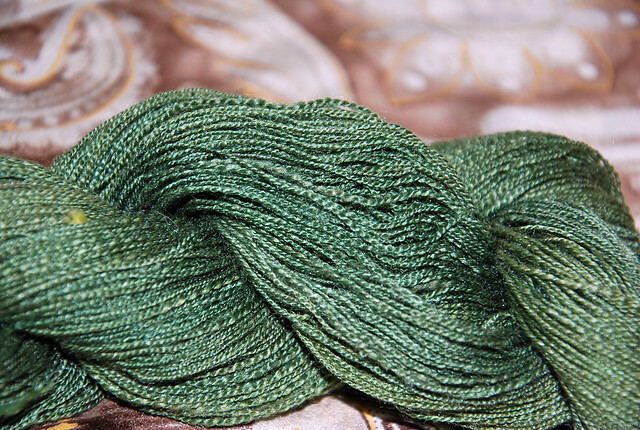 It is sold by Sheepytime Knits, and the colourway is “Elven Cloak” from their now discontinued & glorious Hobbit Club. The second scarf is a gift for a friend. Details are that I sleyed the zephyr 20 ends per inch for 9.3″ width in the 12-dent reed (1-2-2 sley). 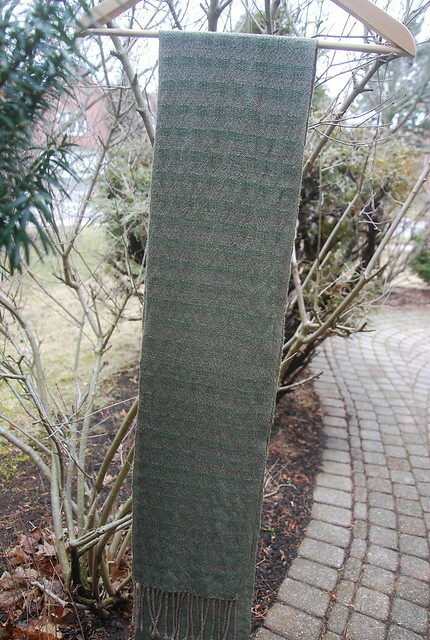 The handspun scarf’s finished width is 7.75″ x 73″ long; 4″ fringes. The Aura Lace scarf measures a cool 8.75″ x 6.25″ with the same fringe length. 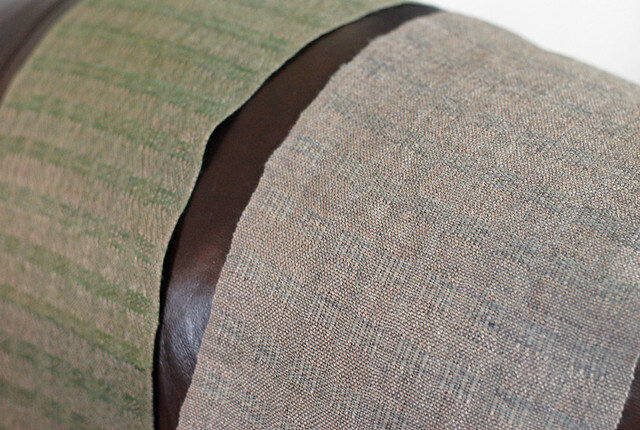 It has an extra plain weave repeat, and I think this held it more open. Weaving time for me was 7 days (nights, really!) from March 10 – 17, 2018. The for-me scarf is lovely, and with our late spring I have been able to wear it several times. The differences between the 2 scarves after finishing are striking. Not only by measurements but also by looks. The “Elven Cloak” was more grey-green in the skein, and lightens the gift scarf considerably. 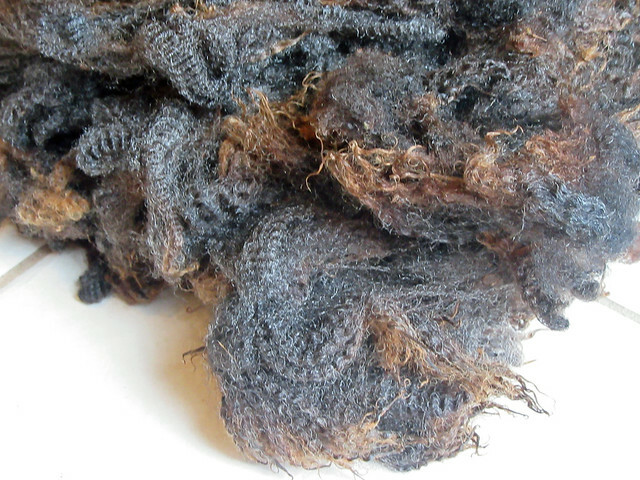 Side-by-side – weft made such a difference! 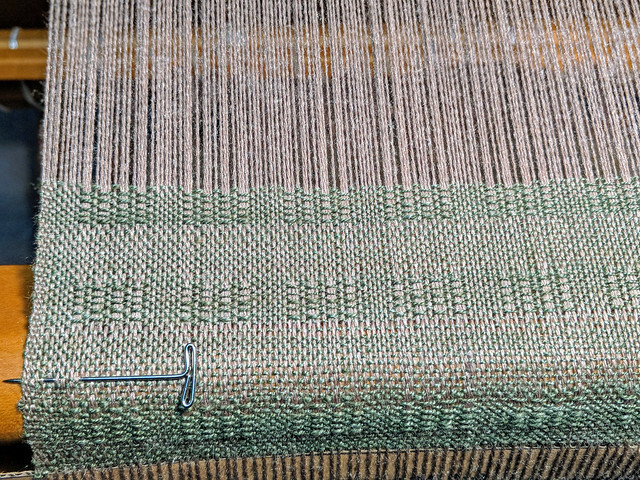 There are more detail pictures that I will move to my (irieknit) Weaving album on Flickr, and the Ravelry weaving project is already up. 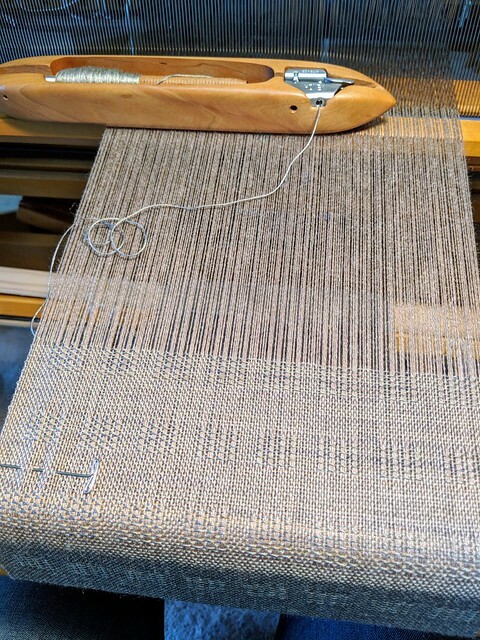 Although my floor loom is empty again, I am weaving a Tattersall check in 5/2 cotton on my table loom now. We have guests visiting next month, and a lot going-on in the school time before then. It’s not just a time crunch but things like windstorms and new after-school activities that we have on the go. 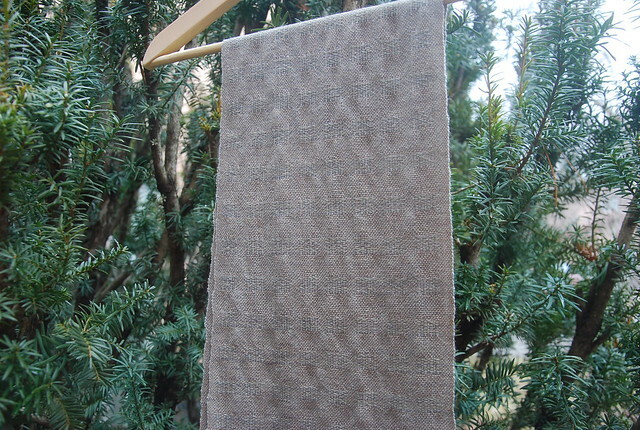 Elven Cloak weft on Zephyr for a gift scarf! Categories: Finished & in the wide world, Weaving | Tags: camel/silk yarn, Equipment, Floor Loom, Materials, Scarf, Zephyr | Permalink. 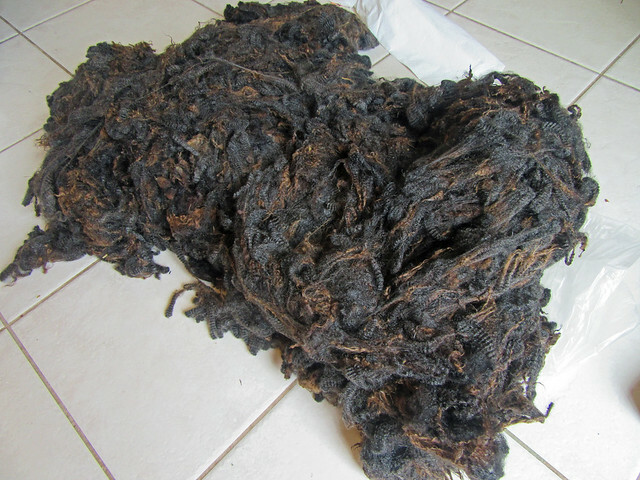 This past Saturday was the 9th annual Woodstock Fleece Festival, and I made it! It is held an hour away by car, and is by faaar my favourite local event for fibre folks. Last year was a definite miss. It’s much improved but a school week is a school week – I can’t predict whether our nurturing reserves dip too low for a Saturday morning trip. Plus, N had a 12:30 pm dental appointment in town. It was a blur! I see from the pamphlet that I totally missed some vendors (sorry, Peggy Sue Collection; The Gaynor Homestead!) but I feel completely rejuvenated by my trip out, and here is why. You may know him as Wheelwright? Reed Needles has repaired one of my antique wheels, and visiting his booth of many Canadian Production Wheels (CPWs) is always a must-do. I was expecting to only say a few words when I had an, “Hey, is that functional, Reed?! ?” moment. It has been totally mentioned by me to Reed a few times now: he is an enabler par excellence. With a twinkle in his eye he noted that yes it works, and that the circa 1860 fittings are hand-forged. The spirals are beautiful, and it fixes the upper roller cage easily/ properly. 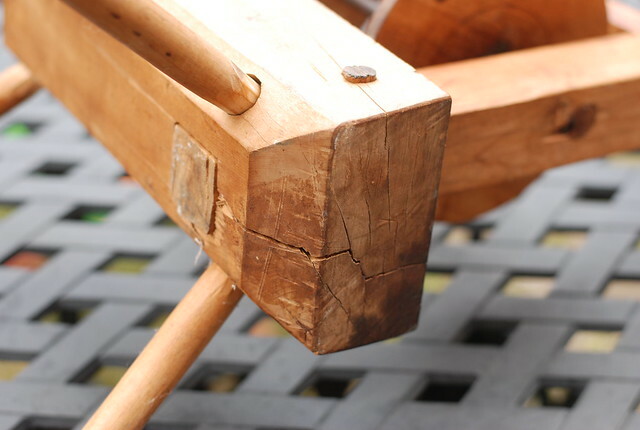 A closer look at the flanged rollers shows yarn (I suspect linen of course) wear on the dowels. Reed was selling this swift on behalf of a local weaver’s estate. 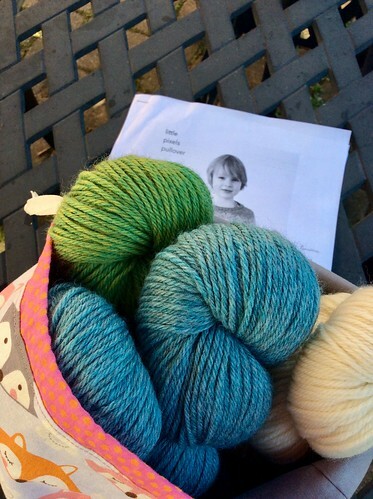 It is sturdy enough for life with an active child + speedy unwinding of skeins. The cut end of the base on the post-side has some deep cracks but this tool will let me unwind yarn gently, and round skeins if needed. Other names for this tool are ‘roller-cage swift’ ‘barrel swift’ and ‘rice.’ According to The Alden Amos Big Book of Handspinning they are believed to have been developed in continental Europe (p. 270). A similar swift with a wooden upper handle is shown in Keep me Warm One Night by the Burnhams (no. 38; see p. 42) as a gift to the Royal Ontario Museum and from Ontario. This swift adds choice because I do have a large umbrella one from Glimåkra that also works well. 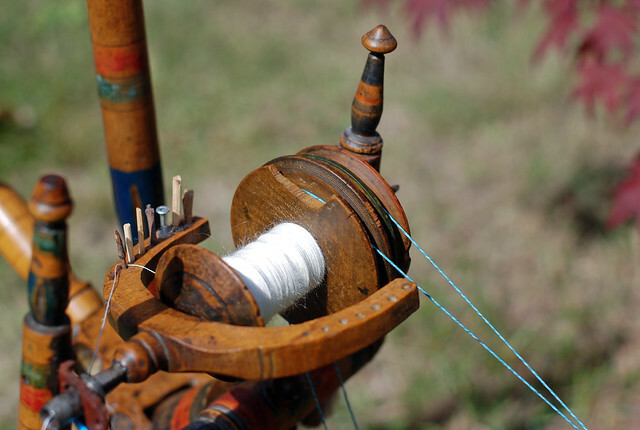 They are both shorter than the skeins wound on my blue antique click reel (i.e. 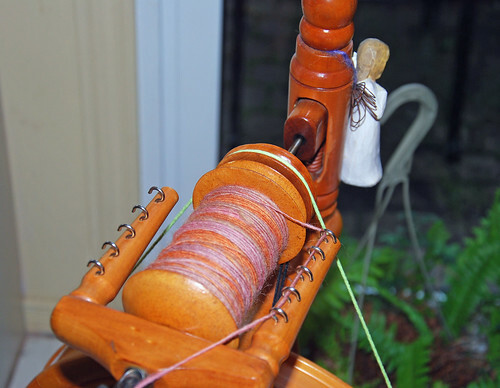 tool that winds skeins). The squirrel-cage may be easier to handle the wider skeins, and I will go very slowly when checking that point out. 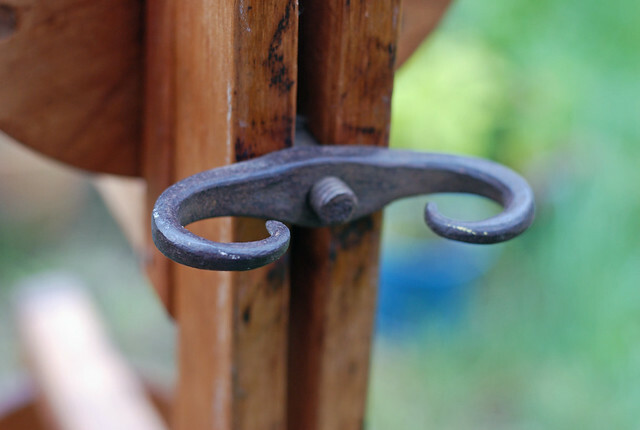 The squirrel-cages will hold more than one skein at a time without needing to collapse the tool as you do with the umbrella. The cages also hold all courses in a skein with even tension across. 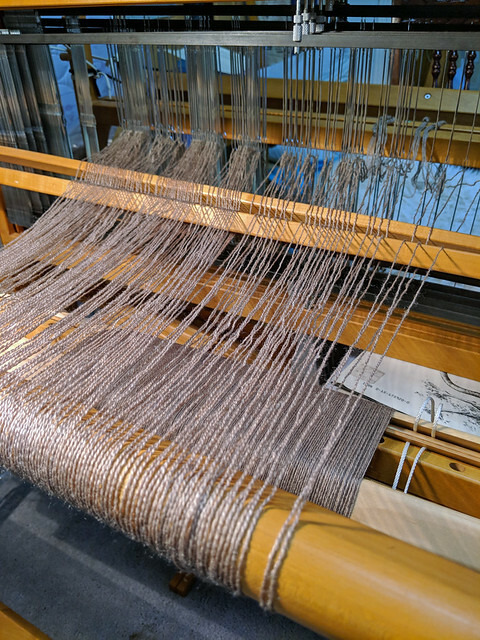 I am interested in how the squirrel-cages compare to the umbrella ‘v-shape’ on unwinding skeins to the warping board for weaving. Growth of this festival year-over-year shows most clearly in the barn marketplace. 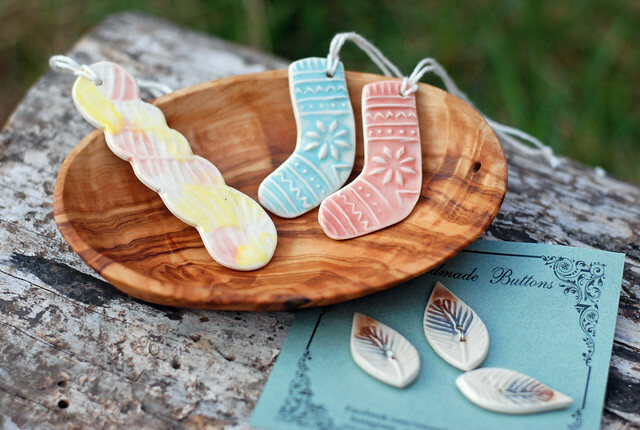 Remembrances Pottery was a fun discovery – their stunning handmade mugs, buttons, etc warranted a quick stop. 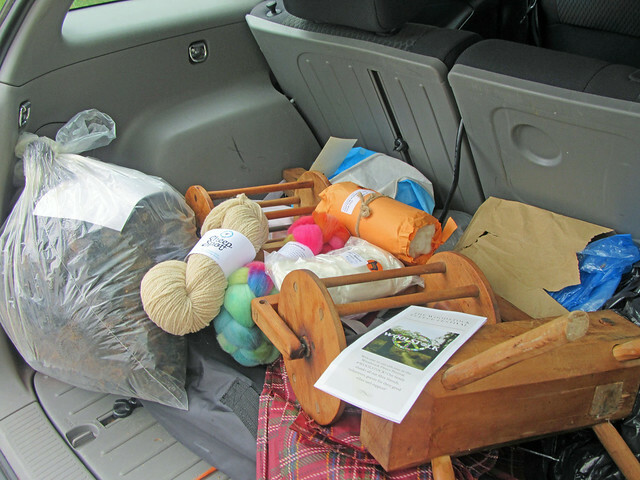 This and other quick stops were accompanied by the bag of raw wool that you can see in my trunk up there. 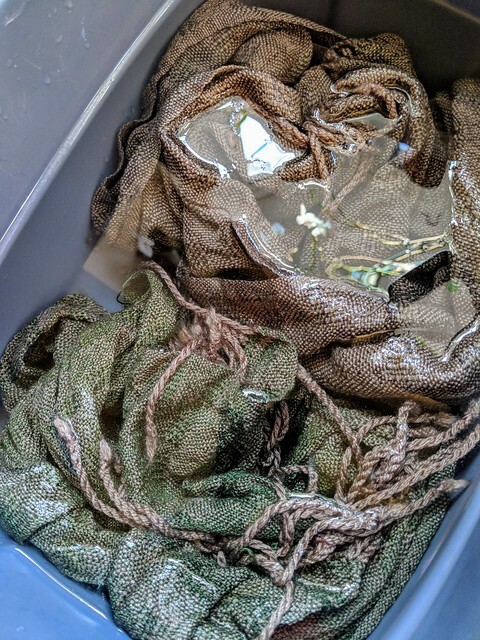 It still needs cleaning! As you may guess from all the talk of rushing, and new time constraints, I probably shouldn’t have. This is a 5 lb 4 oz lamb’s fleece from Willow Farm. In my defense lots of Romney-strong lamb’s wool! The shepherdess, Josslyn, explained that this may be the last year they attend but that farm direct sales are still possible. 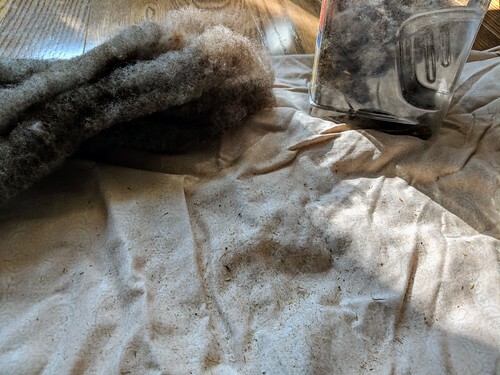 I have missed cleaning fleece so much! 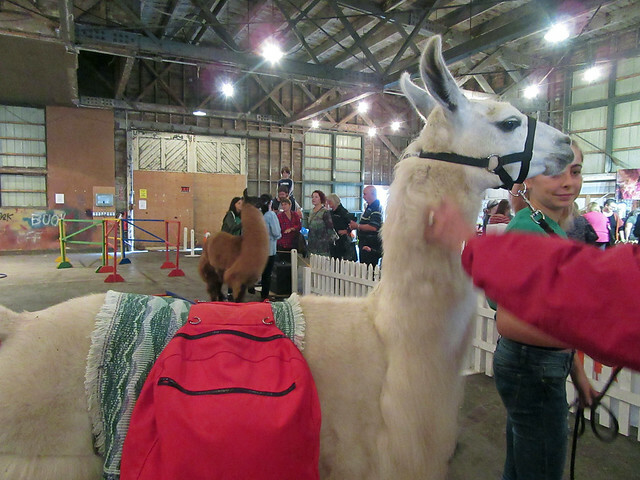 The llama pack and obstacle course was brought to us by the Norfolk 4H. These babies were shy but the performing adults allowed for happy petting. 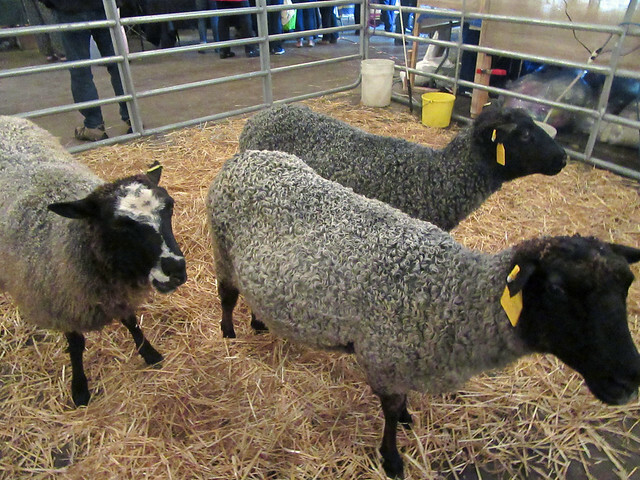 As always festival organisers also had some sheep in the barn for attendees. This family friendly atmosphere is why the event is growing, and I hope to bring N & T next year. 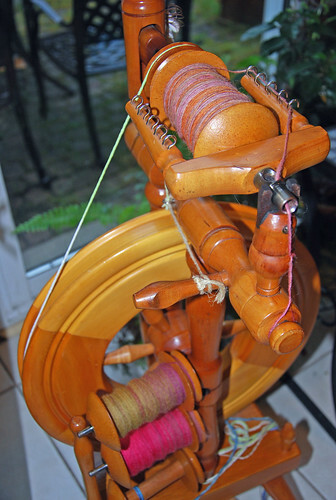 This year, I was thrilled to see some spinning friends at long last, and hit all the high notes. 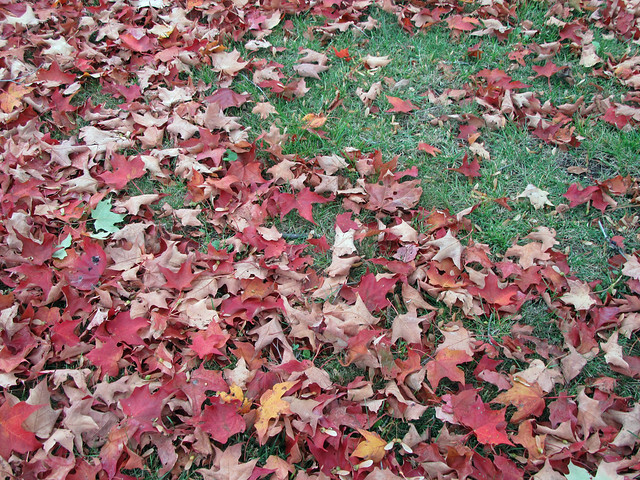 There being much to be done in fall is not new. What is new sits in my immediate family, and would include the words cancer patient & break-up. Necessary but not easy stuff is ahead but we are well in the midst of that. 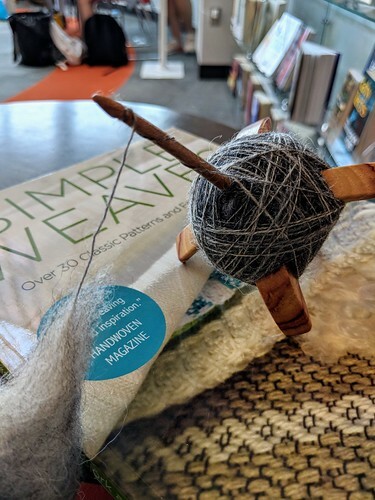 My next warp will be for a head-scarf – pushing the baby blankets behind because first things first. 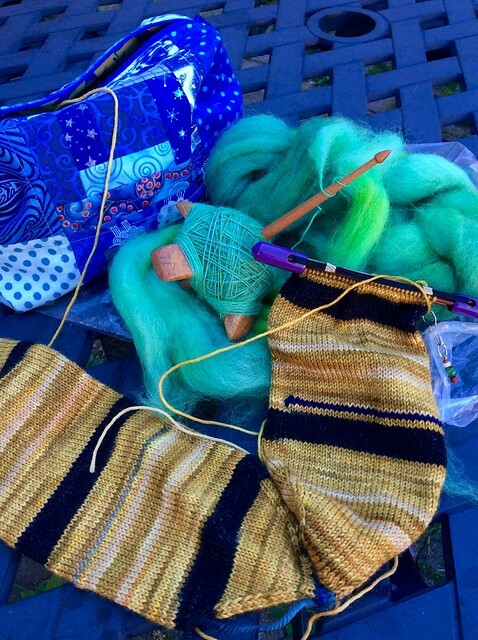 Categories: Fairs & Fiber Festivals, Spinning, Stash in; Stash out | Tags: Equipment, Fauna, raw wool, Romney wool, swift | Permalink.